It's been crazy busy the past couple of days. I've finally got all my chores, running around, etc. done and can spend some quiet, relaxing time in the studio. I have a workshop with Lili and Natasha tomorrow, so I will spend some time this afternoon prepping for that. On to the cards for today. I made another card for this week's color challenge (CC367 - Chocolate Chip, River Rock and Baja Breeze). Made with all SU! products ... hope you like. I removed the mask and placed it covering the water. I sponged River Rock ink over the center area, and sponged Baja Breeze ink all around the rest of the cardstock. I removed the mask. I stamped the sail boat in Chocolate Chip ink, making sure the "waves" were below the horizon line. 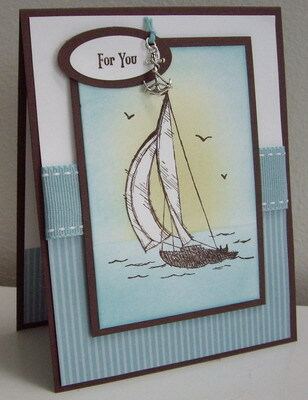 I stamped the image again onto a scrap piece of Whisper White cardstock and cut out the white sails. I glued the white sail on top of the main stamped image. I mounted the main panel onto a frame of Chocolate Chip cardstock. I added Baja Breeze striped DP to the bottom of my Whisper White card front. I attached the ribbon around the middle, secured it at the back and then mounted the card front onto a card base of Chocolate Chip cardstock. I mounted the main panel on top, popping it up with dimensionals to add depth. I stamped the sentiment, punched out the small oval and framed it with a medium oval of Chocolate Chip cardstock. I punch a small hole and threaded through a piece of baker's twine (which I had dyed with Baja Breeze re-inker) and attached the anchor charm. The second card today is a CASE of a card by Colleen Dietrich (Smoatsmom on SCS) ... click here to see her card. I just love the layout of this card - so perfectly CAS. I used all SU! products for this card. I cut 1 1/8" squares from three of the Well Worn DP. I mounted the squares onto coordinating colored cardstock punched with the 1 1/4" square punch. I added a brad to one of the squares. 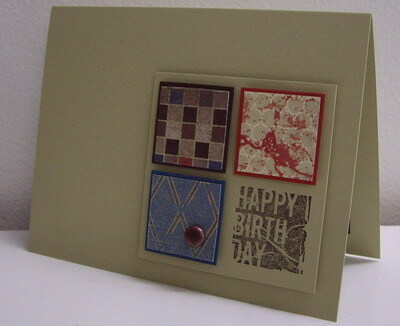 I stamped the "Happy Birthday" in Early Espresso ink onto a square of River Rock cardstock. I mounted the three Well Worn squares around the stamped square, popping each one up with dimensionals. I mounted the square of River Rock onto a card base of River Rock, popping it up with dimensionals to add even more depth. Labels: birthday, CAS, friendship, masculine, paper tole, sponging, Stampin' Up! I appreciate your detailed instructions of the steps you took to create this beautiful "Sail Away" card, thanks.